Jacob Jennings Brown was born in Bucks County, Pennsylvania, on 9 May 1775. His parents were Quakers. He supervised a school at Crosswicks, New Jersey when he was 18 years old, and then turned to surveying in Ohio from 1796 to 1798. After briefly serving as an aide to Major General Alexander Hamilton, Brown founded the village of Brownville on Lake Ontario in New York. He married Pamelia Williams in 1802. He served in the state legislature and as a county judge until 1809. In that year, he became a colonel of militia. In 1811, he was promoted to brigadier general and a year later he was made a major general. 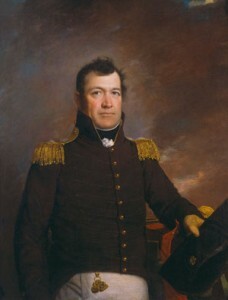 During the War of 1812, Brown commanded the Oswego-Lake St. Francis section of New York before he became a brigadier general in the Regular Army. Soon he became a major general and defeated the British at Chippewa and Lundy’s Lane. Severely wounded at Lundy’s Lane, he received a gold medal from Congress for his actions in the war. Brown was the senior officer in the Army from 15 June 1815 to 24 February 1828. In 1821, he assumed the title of commanding general of the Army. While he served as the commanding general, he urged pay incentives to encourage reenlistments, pay increases for noncommissioned officers, and occasional centralized unit training to avert deterioration in scattered units. Brown died in Washington, D.C., on 24 February 1828.